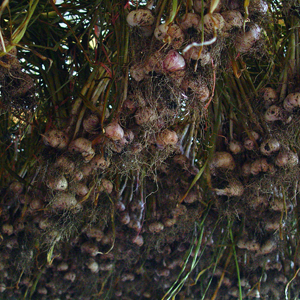 Harvest Moon Garlic was started by a group of friends in 2008 and formally established in 2011. Concerned with the increasing U.S. dependence on foreign food imports we decided to start growing our own. Why garlic? We were introduced to growing garlic by attending a garlic festival, in Minnesota! Before this, garlic seemed an exotic plant that could only grow somewhere far away. To our astonishment some varieties of garlic actually prefer our climate. Using good growing practices since we planted our first clove we continue to follow a strict policy of no chemicals of any type, period. What does our name Harvest Moon Garlic mean? The Harvest Moon refers to the first full moon closest to the autumnal equinox. To northern farmers this full moon was a blessing before modern technology. Without the aid of tractors with bright lights, the farmers were able to continue harvesting crops after sunset by the light of the Harvest Moon. We feel this name roots us to our long family history of farmers and their traditions.